You might notice some changes. Let's talk about them. From Shacknews' humble beginnings as a Quake fan site to our CEO's unhealthy obsession with virtual reality, we've always made a point to find what motivates us and pursue it to its conclusion. While I've been pleased with our progress as a video game and technology site, I feel it's now time to pivot toward my true passion: the beautiful and deadly ocean terrors known collectively as sharks. Effective immediately, we will begin a long-term transition towards covering sharks and shark-related media, under the new banner of Sharknews. We want to become your one-stop resource for everything with even the thinnest relation to sharks--shark movies, shark attacks, productions of West Side Story, etc. When you think about graceful creatures with mouths full of razor blades, we want you to think of Sharknews. We're excited about this new direction, and we hope you are too. * Posts in the Chompy not related to sharks will be nuked and users will be banned. This will be strictly enforced. I certainly hope there is a retrospective look at the Jaws game slated for today. 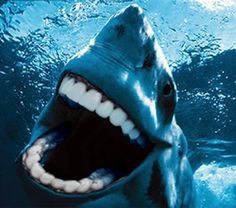 Please to be actually posting Sharknews articles today, or, s0n, I will be very disappoint. Hey, I think this change is fin. FINE. I meant FINE. The site has officially jumped the shark. Aw damn, TraptNSuit beat me to it. Don't spoil next year's idea. Can we FINALLY have a detailed debate about the ending of Sharknado 3? Is she really dead? Will there *REALLY* be a 4th movie? jesus christ there better be! Thank you for subscribing to Shark Facts! Did you know that Blue sharks are piggy eaters? They'll keep eating until they regurgitate, after which they go back to eating! Better than last year's train wreck of a prank. I honestly thought it was hilarious at the time. Moreso the user freak out than the prank itself. Some people just wanna see the world burn. That it, I'm going over to Shanknews. Let's all jump at the same time. I'll miss Shaqnews, but I do look forward to Sundays where people post pictures of their Carsharks and Dogfish. I, for one, welcome our new Shark overlords.